Edward Miller. John Williams. Errol Shaw. Who are these men, and what do they have in common? All three lost their lives when they were shot by police officers. During a time that has seen thousands of people across the country marching in protest of police brutality towards persons of color, Deaf individuals are being painfully reminded of similar incidents within their own community – incidents which have occurred with alarming frequency when communication breaks down. Edward Miller was the recent victim. The 52-year-old Florida man was killed by a sheriff’s deputy in Daytona Beach last September, just a few weeks after the shooting of Michael Brown. As reported by the Daytona Beach News-Journal, Deputy Joel Hernandez pumped six shots into Miller during a dispute outside of a towing company. The Volusia County Sheriff’s Department claims that Miller was “brandishing a firearm,” causing Hernandez to perceive him as a threat and fire his weapon. However, further information released by a local television station states that according to witnesses, Miller was shot as he sat inside his SUV, with windows rolled up and his gun tucked under his shirt, while his son repeatedly yelled to the officers that his father is deaf and can’t understand them. Since the case is currently under investigation, there’s been little information shared since September, although in an article published by the News-Journal in October, a spokesperson for the Sheriff’s office states that Hernandez only fired four times, and that contrary to earlier reports, there were no bullet holes in Miller’s car. Sheriff Ben Johnson continues to insist that Miller was brandishing a firearm, but refuses to discuss any further specifics – including any comments regarding Miller’s hearing loss or attempts to communicate with him. Much like Michael Brown, Edward Miller was portrayed as a violent dangerous criminal, even though his criminal record showed only a misdemeanor which occurred eight years ago. On the other hand, this is the second fatal shooting by Deputy Hernandez in two years, and he also has been reprimanded for using excessive force during an arrest. As CEO Rosenblum states, the Florida shooting is not the first example of such. Such incidents go back at least fourteen years to the case of Errol Shaw in Detroit, who was shot and killed by a police officer in his front yard in August of 2000. Much like the Miller case, the officers involved claim they shot in self-defense when they perceived a potential threat – Shaw coming towards them holding a garden rake over his head. Again, family members allegedly shouted out that Shaw was deaf, a statement the officers claim to have never heard. In this case, the man responsible – David Krupinski – was charged with manslaughter, and during a two-week trial in 2001, prosecutors argued that Krupinski had used excessive force, making himself Shaw’s “judge, jury, and executioner” when he fired his gun. The jury deliberated for 41/2 hours before finding Krupinski not guilty. 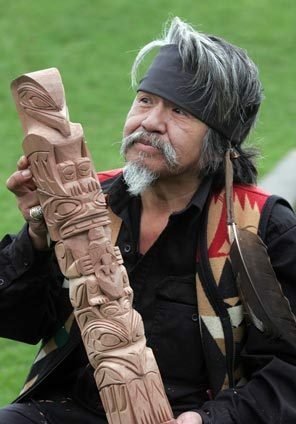 Ten years later, in August of 2010, history repeated itself when Seattle police officer Ian Birk fatally shot and killed a Native American woodcarver named John Williams. After seeing Williams crossing the street holding a carving knife, which he was using on a piece of wood, Birk approached from behind and shouted out repeatedly to “put the knife down!” Family members attest that due to a significant hearing loss, Williams most likely did not understand the officer’s command. Birk claims he felt threatened and fired in self-defense. The Seattle Police Department didn’t agree. Birk was ordered to surrender his gun and badge, and following an investigation, top police officials concluded that the shooting had been unjustified and recommended that the officer be released of his duties. However, an inquest found the jury split on the matter and unable to agree on whether Williams actually imposed a threat. Birk was never formally charged for the shooting, although in the wake of the public outcry and the department’s findings he chose to resign from the force. The city of Seattle settled the case by paying $1.5 million to the Williams family. One might consider three deaths in 14 years to be insignificant, but it’s three deaths too many. And there’s actually others – and not merely men, either. In April of 2011, the Los Angeles Police Department underwent investigation for the fatal shooting of a 57 year old woman whom family members stated was deaf. These shootings serve to accentuate an on-going concern that many in the Deaf Community have – the actions of police officers in attempting to deal with deaf or hard of hearing individuals. A Google search turns up more than a dozen incidents involving police brutality against deaf and hard of hearing people all over the country – all within the last decade. While fatal shootings are the extreme, there are plenty of reports of victims – both male and female – being beaten, pummeled, choked, tasered, or peppered sprayed. In more than one case, the victim was arrested and taken to jail without the services of a sign language interpreter. Such was the case of Douglas Bahl of Minnesota, who was held in the Ramsey County Prison for several days, with no effective way to communicate with jail staff or with worried family members, who had no idea where he was or what had happened to him. And just earlier this year, Abrehem Zemedagegehu, a Deaf immigrant from Ethiopia who cannot write English but is fluent in American Sign Language, spent six weeks in Arlington County Detention Facility in Virginia without an interpreter on suspicion of having stolen an iPad, which was later discovered to have been found by its owner. The National Association of the Deaf has filed a lawsuit against the Arlington County Sheriff’s Office for violating Zemedagegehu’s civil rights. These stories highlight a problem that deaf and hard of hearing individuals have experienced time and time again – the lack of awareness about deafness, Deaf Culture, and communication needs by police officers. 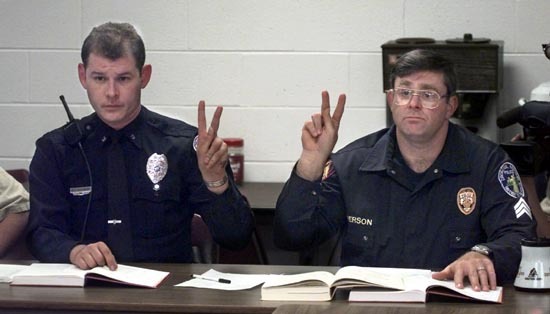 While the Americans with Disabilities Act states that deaf and hard of hearing people are entitled to the same services that law enforcement provides to anyone else, nearly twenty-five years later police departments continue to be woefully undertrained in how to provide such services in an effective manner. Many officers do not know how to appropriately interact with Deaf individuals, communicate properly with them, or how to secure interpreting services as needed. 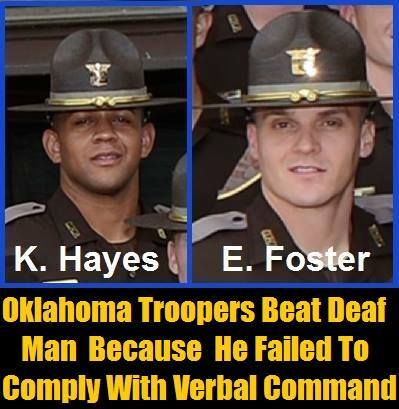 And likewise, many deaf and hard of hearing people do not know how to best deal with law enforcement in various situations, or are aware of their own rights when they encounter police officers. It is for this reason that well-known Deaf actress Marlee Matlin, who is herself married to a police officer, decided to team up with the American Civil Liberties Union (ACLU) and HEARD (Helping Educate to Advance the Rights of the Deaf) to create a PSA video to help educate Deaf people on their rights, and also what to do in various police situations such as traffic pull-overs or arrests. Now the ACLU, HEARD, NAD, and local Deaf agencies – with assistance from the U.S. Department of Justice – are working with law enforcement agencies around the country to educate police officers on how to better serve deaf and hard of hearing people and to deal with potential communication issues. Videos and training programs are being created. Hopefully such efforts will help to prevent future shootings, unnecessary beatings, wrongful arrests, and the lack of communication access while incarcerated. Most importantly, the goal of such trainings is to replace ignorance with knowledge, and to enhance sensitivity and understanding. As Marlee says, it’s time for the Police Community and the Deaf Community to work together to “bridge the gap” – a gap that has existed for far too long, and is just as significant to deaf and hard of hearing people as is the chasm that has created the tense relationship between law enforcement and people of color. While certainly the issues are different and must be addressed differently, the parallelisms between these two situations can be identified: the lack of trust, suspicion, animosity, fear, and outrage – all leading to a growing recognition of the need for change. Hopefully with ongoing efforts, we can begin moving forward and making positive progress towards creating such change.